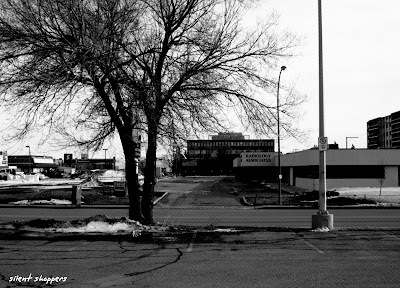 On a freezing day in March 2005, Silent Shoppers (or what was Yellow Tag Clearance at the time) was shot in this parking lot as part of a film school assignment. Upon revisiting the location in March 2009 not a whole lot had changed. While the mall (which is behind me in this picture) has seen some major stores come and go, this vantage point I used for my movie is pretty much identical. Although, this time the weather was far more bearable.